Are you dying to get your hands on a different and interesting costume! 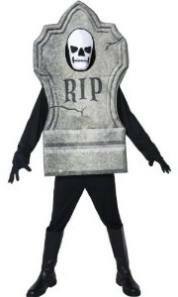 Well, no need to go all the way as in this one size fits most Gravestone Fancy Dress Outfit, you can RIP (rave in party) all night long. It's easy to wear too as it simply slips on over your own dark clothing and comprises of a 3D foam gravestone suit with a black and white skull mask. You can add some black gloves to complete the look (available separately). Very like the costume in the BT ad with the Halloween party - they used grey face paint (also available separately) rather than the skull mask.